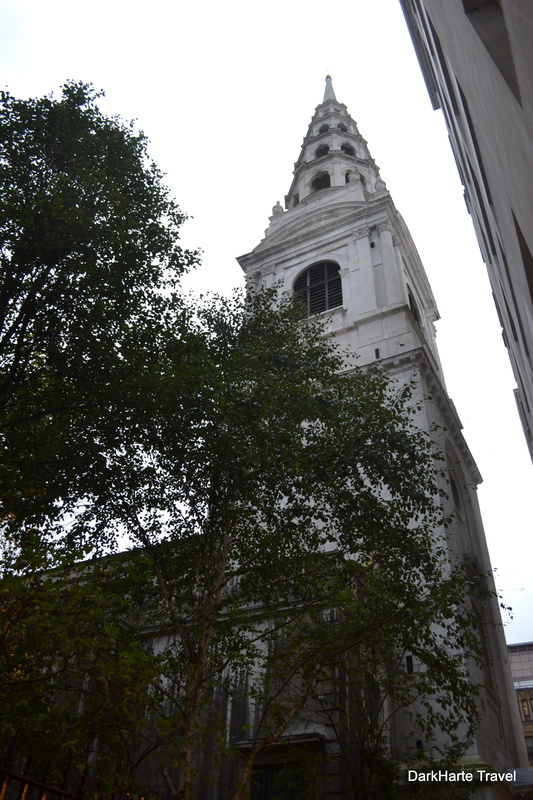 I stumbled upon St Bride’s Church when wandering through narrow alleyways between Temple and Fleet Street. 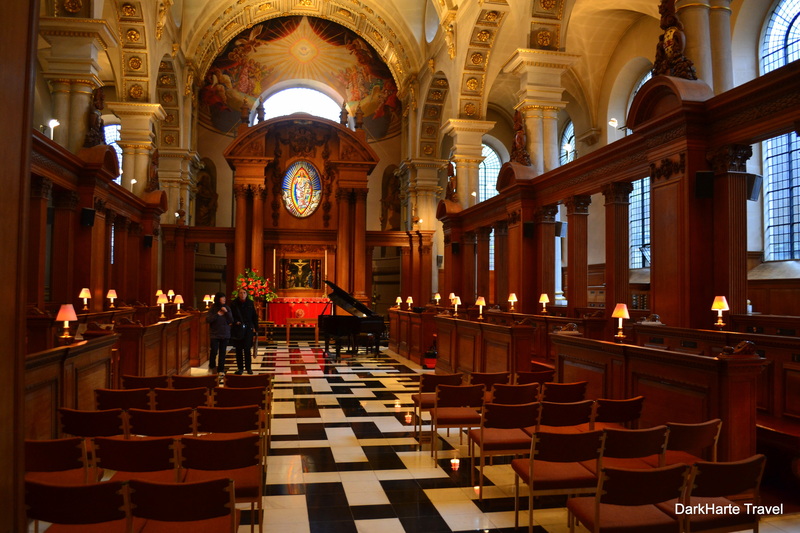 It is a church designed by Sir Christopher Wren, architect of St Paul’s. 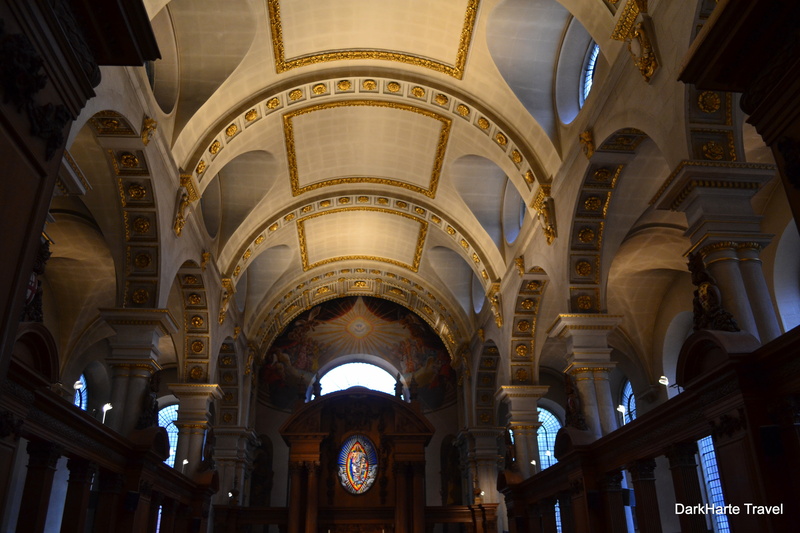 The interior of the church is strikingly beautiful. 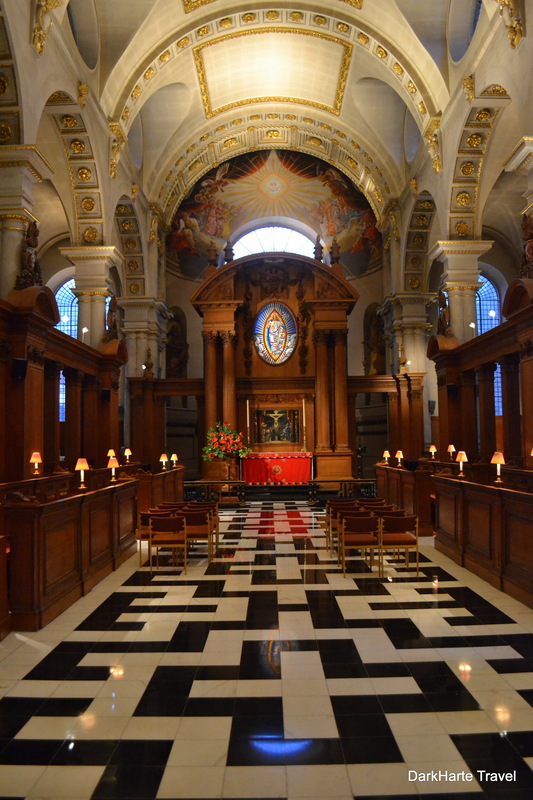 The floor is made of black and white squares of marble, surrounded by dark panelled wood. 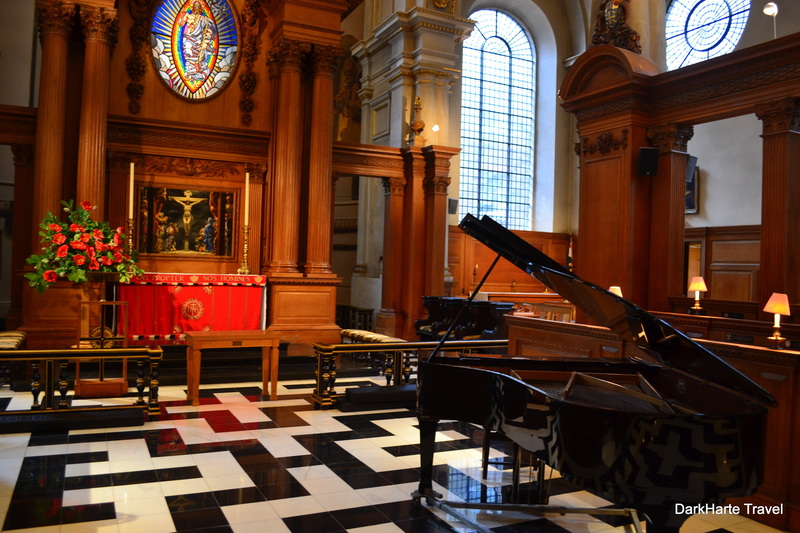 There was a grand piano in the aisle near the altar, and its shiny blackness formed a dazzling complement with the black and white marble squares of the floor. It all seemed shiny and bright with light. 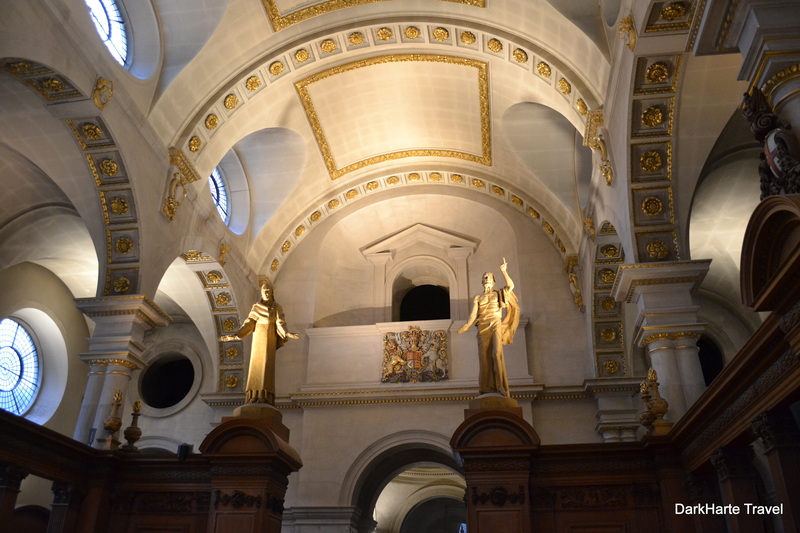 Even better is that this church has a crypt and a charnel house below. We walked down the stone steps into an atmosphere of cold air, descending into the crypt. Inside the the crypt is a small museum. 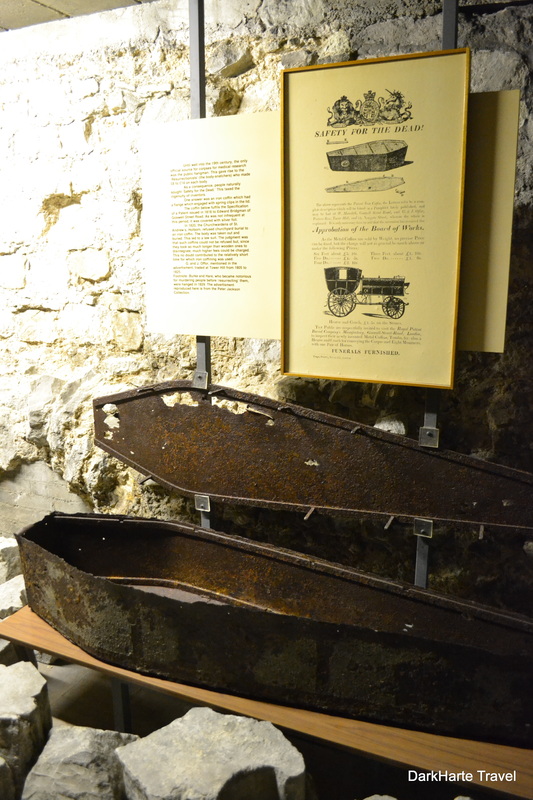 On display are interesting coffins like this iron one. People were buried in iron coffins, nailed shut, in the times of the body snatchers. 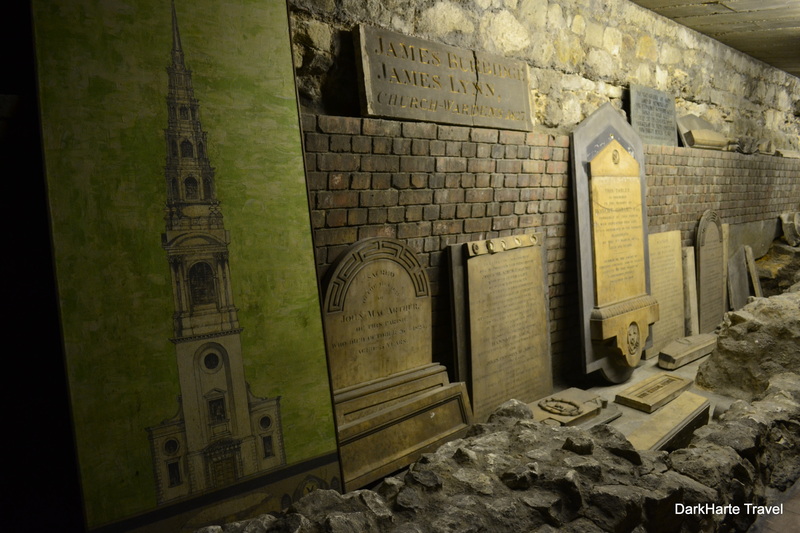 London graveyards were plagued by body snatchers who sold bodies and body parts to medical schools for research, as the only legitimate means of obtaining human cadavers at that time was the bodies of executed criminals, and there was not enough supply to meet demand. The sign above this coffin calls attention to ‘safety for the dead’, which was a real concern in the 19th century. 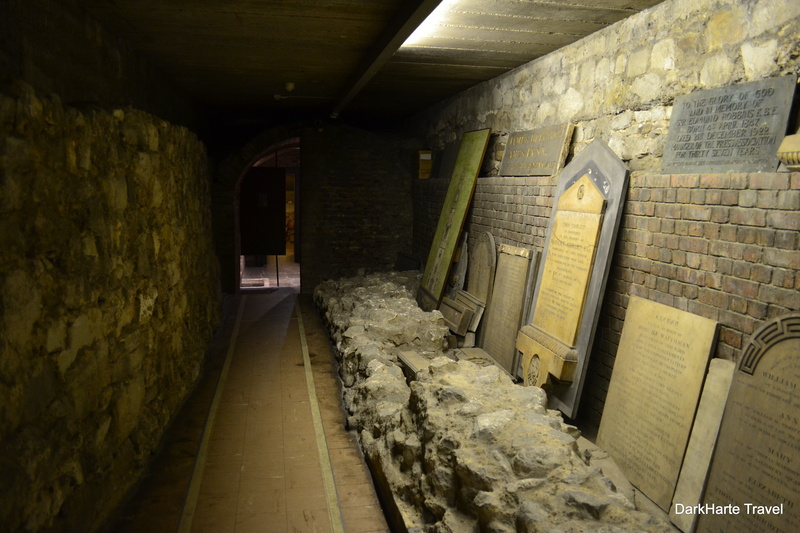 The medieval foundations of the church are visible in the crypt, and so are older, Roman remains. 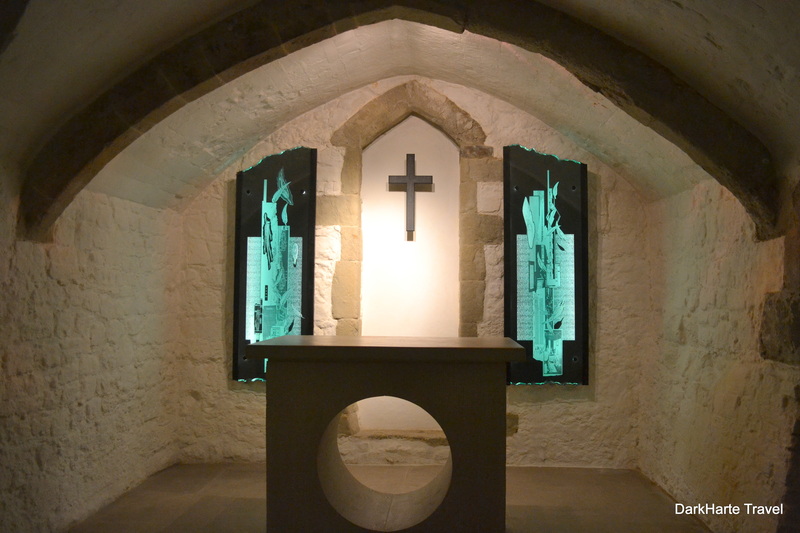 There are two small chapels in the crypt, where services can take place. I really liked this little underground, whitewashed chapel, which is at the back of the crypt. It is a simple chamber and very peaceful to sit in for a few moments. 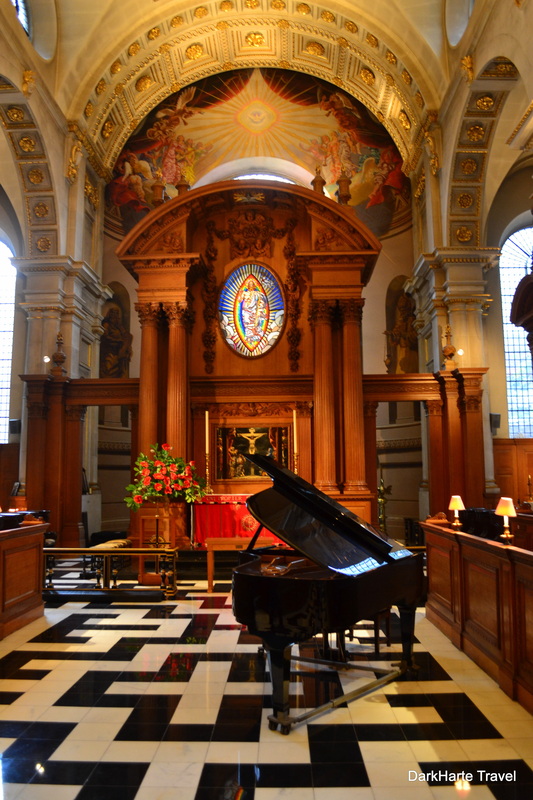 Due to its location off Fleet Street, St Bride’s has long had an association with journalism and the media. 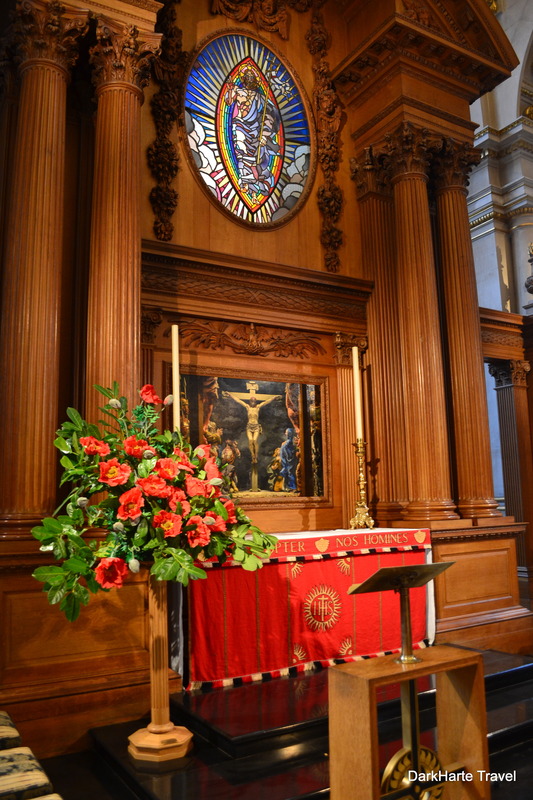 There is a place in the church dedicated to photographs of and prayers for journalists and broadcasters who have been killed in war, or who are currently endangered because of their work, including those kidnapped in Syria by IS. The charnel house is only open at certain times and was unfortunately closed when we were there, but I hope to go back and see it another time. We went outside to look for the famous wedding-cake spire, a tall white tower built of layers like the tiers of a wedding cake. Rather dwarfed now by the taller buildings all around it, in Wren’s time it would have been one of the greatest buildings around. St Paul’s Cathedral can be seen in a direct line east from St Bride’s, and both were major landmarks in the 17th century London skyline. 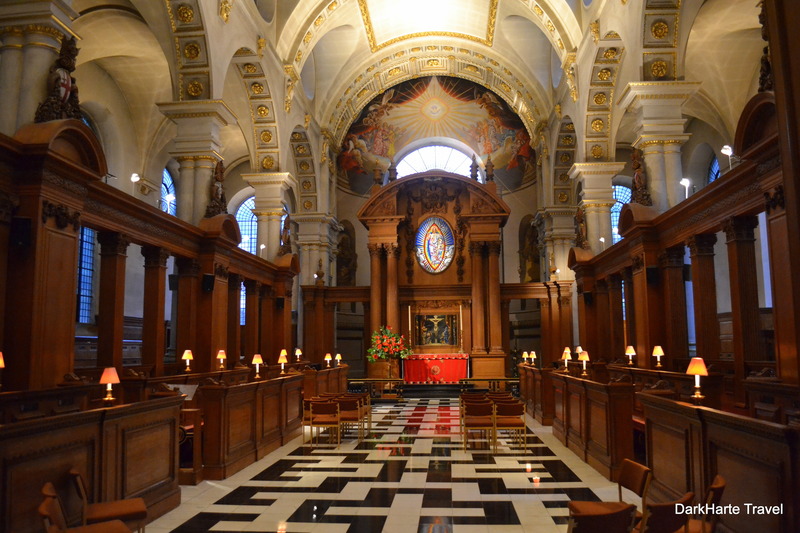 The original St Bride’s Church was destroyed in the Great Fire of London in 1666, after which it was rebuilt in 1672 by Christopher Wren. Wren’s church was then ruined again in bombing during World War II. 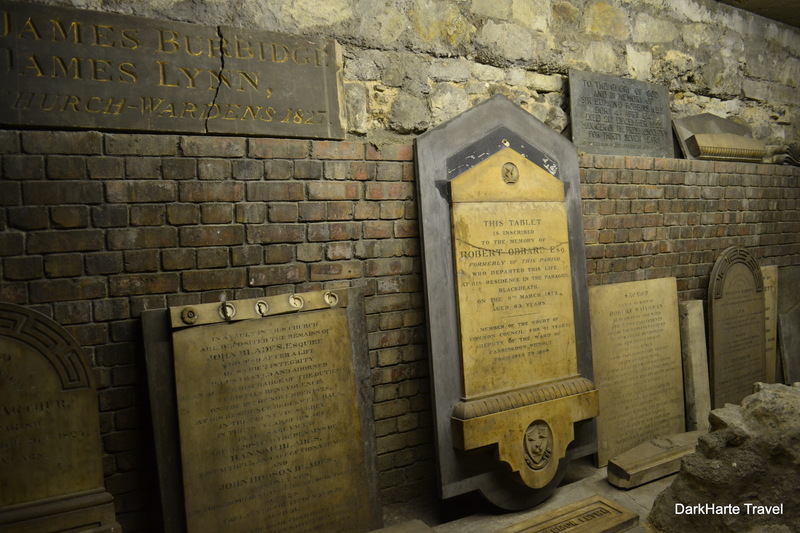 It was in renovating St Bride’s after the Second World War that the remains of six previous incarnations of St Bride’s Church were excavated on the site. Beautiful! 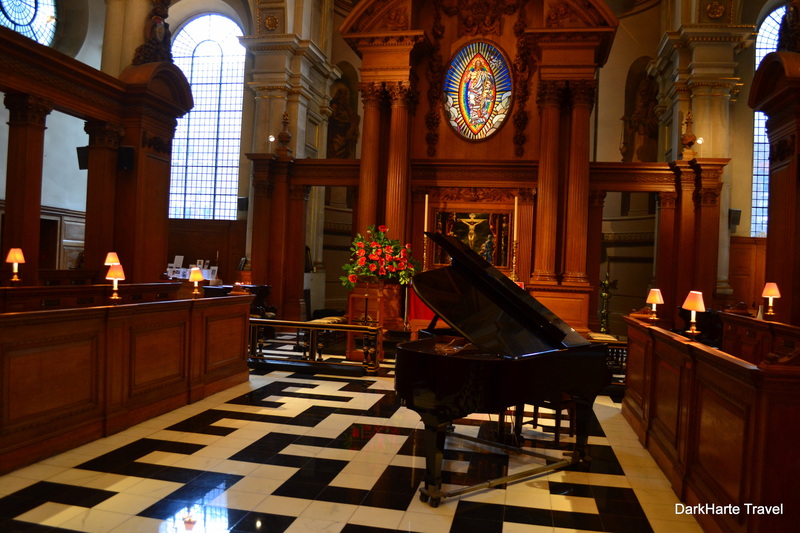 Fantastic piano and crypt full of history. An amazing find!